It's probably the world's best job for a fishing fanatic. How did he get it? Editor's note: This is the latest installment in a new mini-series on some of the most unusual and amazing jobs in the travel industry. Mark Benson is the Director of Fly Fishing at Grande Lakes Orlando, which comprises The Ritz-Carlton Orlando, Grande Lakes and the JW Marriott Orlando. When people say “Captain Mark has ‘gone fishing,’” they’re not joking. Fans who've longed to run a road race through the park: your time has arrived. How'd they get that job? We find out. My typical day is taking guests fishing on the many lakes throughout the extensive Grande Lakes Orlando property. I consider myself fortunate to be one of the very few people to carry the Director of Fly Fishing title and to be able to share my angling experience and love of the outdoors with guests in such a beautiful place in Florida. (The Ritz-Carlton Orlando, Grande Lakes) Fly fishing at Grande Lakes Orlando. 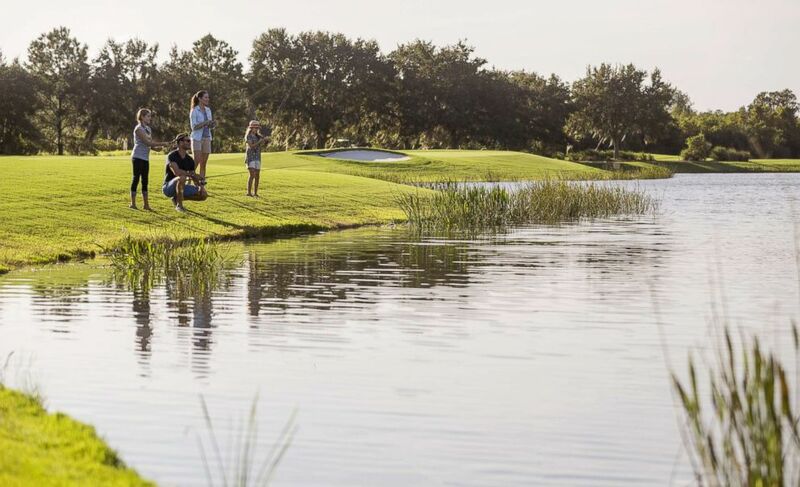 Comprised of The Ritz-Carlton Orlando, Grande Lakes and the JW Marriott Orlando, the Grande Lakes Orlando resort is set on 500 beautifully-wooded acres adjacent to Shingle Creek, the headwaters of the Florida Everglades. For anyone who wants to experience a more authentic Florida, the grounds at Grande Lakes Orlando largely represent the way Central Florida began. The resort’s land used to be a cattle ranch and was home to the original cowboys from Spain who settled in Florida in the 1500s. 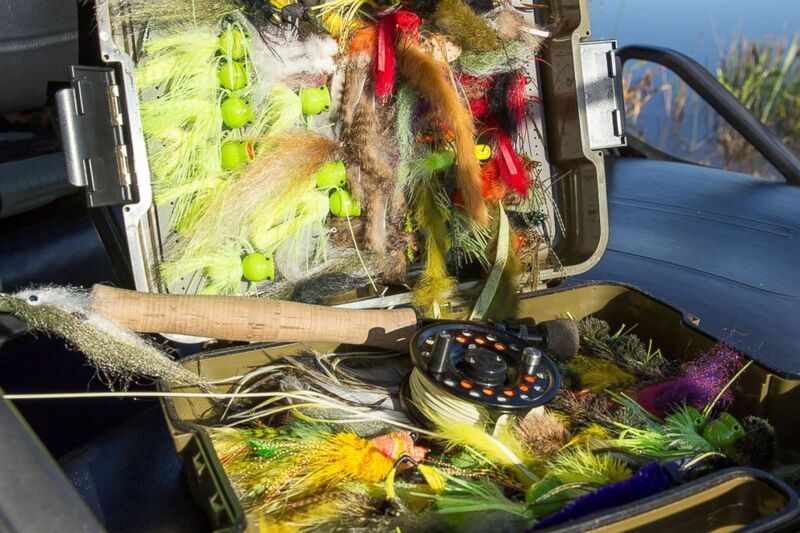 (The Ritz-Carlton Orlando, Grande Lakes) Captain Mark Benson's fishing supplies. I grew up in Central Florida fishing, swimming, and boating the lakes, creeks and coastal waters with my dad. After catching my first fish at the age of four, much of my youth was spent fishing along Shingle Creek, which runs along the western border of Grande Lakes Orlando today. 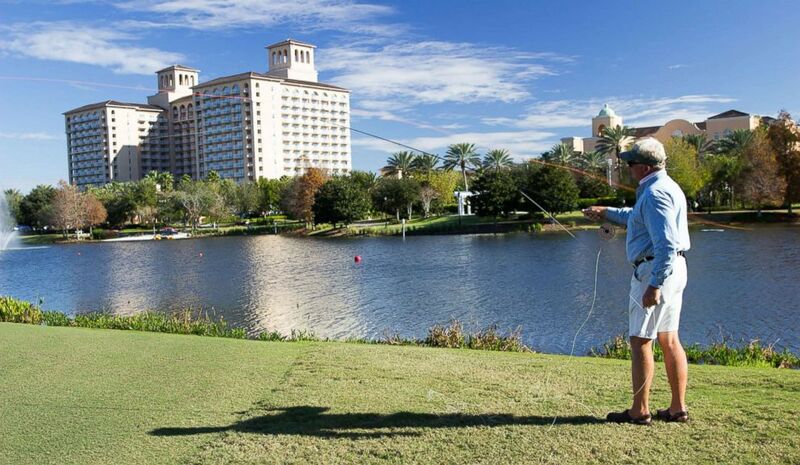 (The Ritz-Carlton Orlando, Grande Lakes) Captain Mark Benson is the Director of Fly Fishing at Grande Lakes Orlando. After graduating from college, I traveled the world — fishing, scuba diving, and snorkeling in exotic locations — before coming back to Florida for jobs at a fish hatchery and also an aquaculture company in lakes management. In many ways being tapped to head the fishing program at Grande Lakes feels like a homecoming, where I’m grateful to have adventured and collected experiences and stories I can share with guests. One of my more interesting stories is actually about the world-renowned hotelier, Cesar Ritz, whose son Charles spent considerable time mastering the art of fly fishing after he returned from serving in World War I. Ernest Hemingway hailed Charles as “one of the finest fly fisherman I know.” Charles penned one of my favorite books, “A Fly Fisher’s Life.” So, in a way, a fly fishing program offered at a Ritz-Carlton is a homecoming of its own. I enjoy showing our guests, many of whom have come to Orlando for the entertainment and attractions, a side of the region that is so unexpected. It’s especially gratifying when those who tend to spend their lives on a cell phone allow themselves to be truly present, enjoying quality time in nature and with their fishing partners. The cell phone tends to come out only when it’s time to photograph their catch! If you’re not a fly fisher, we also offer spinning tackle on our excursions as well. We book fishing trips by the hour with the standard duration about two to three hours and ideally at first light. With an early start, guests can fish for a couple hours and still make it to their conference, theme parks, and other Central Florida attractions that may have brought them here. The cell phone tends to come out only when it’s time to photograph their catch! We guide guests either by shore, using a specially-rigged golf cart to travel among our 11 private and managed lakes, or on a Hyde drift boat, where up to two anglers can fish simultaneously. We also offer introduction to fly fishing classes and fly casting lessons for beginner, intermediate, and advanced anglers. Our program at Grande Lakes Orlando is catch and release, meaning we don’t use live bait, only artificial lures or flies. When a guest catches a fish, we’ll quickly snap a photo then release the fish back into the water. For a number of guests, this can spur a conversation about conservation. I’m conscious of responsibly promoting the sport as well as being a good steward of our valuable natural resources. We’re happy to host people who have never fished before, people who are really into the sport, and even young anglers who arrive with their own tackle boxes and are ready to go catch a big one. I’ve created amazing friendships with many of our guests who will text me photos of their “great catches” years after they have been here. I especially appreciate hearing about kids who caught their first fish here and are proudly carrying the photo from that day with them, counting down to when they’ll be able to return. Those kids remind me of me.